GoalPost Ireland - Tallow, Co. Waterford, Ireland. Goalpost Ireland is an experienced designer, manufacturer and supplier of sports pitch equipment and an expert in the field of Goalpost Safety. We work continuously with Governing Bodies and within the sports industry to develop and promote Goalpost Safety Standard Compliance and Goalpost Maintenance & Storage requirements. On-Line: Simply select the product and the quantities you wish to purchase and follow the instructions. Phone: Call us on 058 56326 (International: +353 58 56326) and a member of our sales team will be happy to assist you. 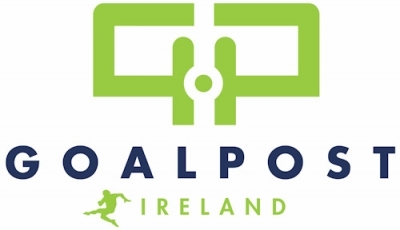 Post: Write to us or download our order form and post to Goalpost Ireland limited, Tallow, Co. Waterford, Ireland. Mailing List: Like us on FACEBOOK or sign in for our mailing list on line for all our product updates, promotions and prices. Our Goalposts are manufactured in compliance with the International Safety Standards: IS356:2007, EN748, EN 749, BS 8462:2005. Complying with these standards is our guarantee of superior products.